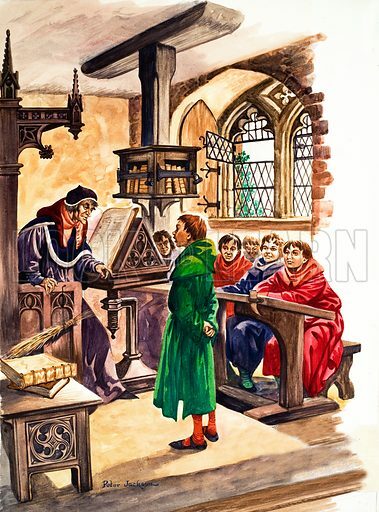 The Wonderful Story of Britain: Schools in the Middle Ages. A classroom in the Middle Ages where a pupil answers questions as the other scholars listen silently, afraid of the schoolmaster's birch. Original artwork from Treasure no. 74 (13 June 1964). Available worldwide for immediate download up to 3,442 x 4,648 pixels.